It's time for another new variety, grapehounds. Falanghina is ancient white wine grape that is (as near as we can tell) native to Campania. According to Jancis Robinson, there are just under 800 acres of the grape in cultivation which makes it a relative rarity. 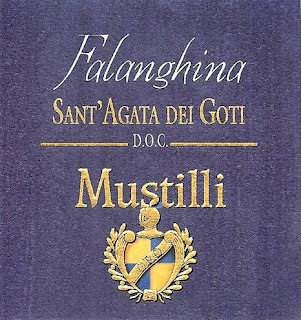 The 2008 Mustilli Falanghina is a joyful, fresh white that was a welcome change of pace for my tastebuds. (suggested retail, $18) Aromas of lemon curd, stone, and hay suggested the last days of summer, while the intense lemony flavors had mineral notes that added a nice complexity. The wine's juicy acidity will make it a good food wine, and the bit of salt in the aftertaste gave a final, savory quality to the aftertaste that had me reaching for the glass again and again. Excellent QPR on this complex, versatile white. It's hard to imagine any fish, shellfish, vegetable, or chicken dish this wine wouldn't complement, but if you're searching for inspiration try this shrimp pasta dish from Rachael Ray. It's a riff on Puttanesca, with olives, capers, garlic, and red peppers along with shrimp and fresh cherry tomatoes. The salty notes in the wine were a brilliant accent for the olives and capers, and the lemony freshness was terrific with the shrimp and tomatoes. I'm a fan of Falangina, partly because of its history, but it's also good! i'm going to have to give falangina another try - i've had several bottles and haven't walked away too impressed. the wines i have had have been rather dull/flat/one-note, and the price points (over $20) would lead me to expect more.